Parts of a replica of the Copper Scroll. The Copper Scroll (3Q15) is one of the Dead Sea Scrolls found in Cave 3 near Khirbet Qumran, but differs significantly from the others. Whereas the other scrolls are written on parchment or papyrus, this scroll is written on metal: copper mixed with about 1 percent tin. Unlike the others, it is not a literary work, but a list of places where various items of gold and silver are buried or hidden. It differs from the other scrolls in its Hebrew (closer to the language of the Mishnah than to the literary Hebrew of the other scrolls, though 4QMMT shares some language characteristics), its orthography, palaeography (forms of letters) and date (c. 50–100 CE, possibly overlapping the latest of the other Qumran manuscripts). 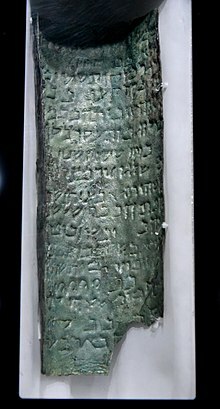 Since 2013, the Copper Scroll has been on display at the newly opened Jordan Museum in Amman after being moved from its previous home, the Jordan Archaeological Museum on Amman's Citadel Hill. A new facsimile of the Copper Scroll by Facsimile Editions of London was announced as being in production in 2014. While most of the Dead Sea Scrolls were found by Bedouins, the Copper Scroll was discovered by an archaeologist. 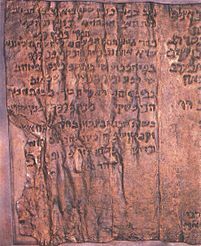 The scroll, on two rolls of copper, was found on March 14, 1952 at the back of Cave 3 at Qumran. It was the last of 15 scrolls discovered in the cave, and is thus referred to as 3Q15. The corroded metal could not be unrolled by conventional means and so the Jordanian government sent it to Manchester University's College of Technology in England on the recommendation of English archaeologist and Dead Sea Scrolls scholar John Marco Allegro for it to be cut into sections, allowing the text to be read. He arranged for the university's Professor H. Wright Baker to cut the sheets into 23 strips in 1955 and 1956. It then became clear that the rolls were part of the same document. Allegro, who had supervised the opening of the scroll, transcribed its contents immediately. The first editor assigned for the transcribed text was Józef Milik. He initially believed that the scroll was a product of the Essenes but noted that it was likely not an official work of theirs. At first he believed that it was not an actual historical account; he believed it was that of folklore. Later however, Milik's view changed. Since there was no indication that the scroll was a product of the Essenes from the Qumran community, he changed his identification of the scroll. He now believes that the scroll was separate from the community, although it was found at Qumran in Cave 3, it was found further back in the cave, away from the other scrolls. As a result, he suggested the Copper Scroll was a separate deposit, separated by a "lapse in time." Although the text was assigned to Milik, in 1957 the Jordanian Director of Antiquities approached Allegro to publish the text. After a second approach by a new director of Jordanian Antiquities, Allegro, who had waited for signs of Milik of moving to publish, took up the second request and published an edition with translation and hand-drawn transcriptions from the original copper segments in 1960. Milik published his official edition in 1962, also with hand-drawn transcriptions, though the accompanying black-and-white photographs were "virtually illegible". The scroll was re-photographed in 1988 with greater precision. From 1994 to 1996 extensive conservation efforts by Electricité de France (EDF) included evaluation of corrosion, photography, x-rays, cleaning, making a facsimile and a drawing of the letters. Emile Puech's edition had the benefit of these results. Scholarly estimates of the probable date range of The Copper Scroll vary. F.M. Cross proposed the period of 25-75 CE on paleographical grounds, while W.F. Albright suggested 70-135 CE and Manfred Lehmann put forward a similar date range, arguing that the treasure was principally the money accumulated between the First Jewish–Roman War and the Bar Kokhba revolt, while the temple lay in ruins. P. Kyle McCarter Jr., Albert M. Wolters, David Wilmot and Judah Lefkovits all agree that the scroll originated around 70 CE. Whereas Emile Puech argued that the deposit of the Copper Scroll behind 40 jars could not have been placed after the jars, so the scroll "predates 68 CE." Józef Milik proposed that the scroll was written around 100 CE, nearly a "generation after the destruction of Jerusalem." If Milik's dating of the scroll is correct, it would mean that the scroll did not come from the Qumran community because his dating puts the scroll "well after the Qumran settlement was destroyed." The style of writing is unusual, different from the other scrolls. It is written in a style similar to Mishnaic Hebrew. While Hebrew is a well-known language, the majority of ancient Hebrew text in which the language is studied is generally biblical in nature, which, of course, the Copper Scroll is not. As a result, "most of the vocabulary is simply not found in the Bible or anything else we have from ancient times." The orthography is unusual, the script having features resulting from being written on copper with hammer and chisel. There is also the anomaly that seven of the location names are followed by a group of two or three Greek letters. Also, the "clauses" within the scroll mark intriguing parallels to that of Greek inventories, from the Greek temple of Apollo. This similarity to the Greek inventories, would suggest that scroll is in fact an authentic "temple inventory." Some scholars believe that the difficulty in deciphering the text is perhaps due to it having been copied from another original document by an illiterate scribe who did not speak the language in which the scroll was written, or at least was not well familiar. As Milik puts it, the scribe "uses the forms and ligature of the cursive script along with formal letters, and often confuses graphically several letters of the formal hand." As a result, it has made translation and understanding of the text difficult. The text is an inventory of 64 locations; 63 of which are treasures of gold and silver, which have been estimated in the tons. For example, one single location described on the copper scroll describes 900 talents (868,000 troy ounces) of buried gold. Tithing vessels are also listed among the entries, along with other vessels, and three locations featured scrolls. One entry apparently mentions priestly vestments. The final listing points to a duplicate document with additional details. That other document has not been found. The following English translation of the opening lines of the first column of the Copper Scroll shows the basic structure of each of the entries in the scroll. The structure is 1) general location, 2) specific location, often with distance to dig, and 3) what to find. There is a minority view that the Cave of Letters might have contained one of the listed treasures, and, if so, artifacts from this location may have been recovered. Although the scroll was made of alloyed copper in order to last, the locations are written as if the reader would have an intimate knowledge of obscure references. For example, consider column two, verses 1–3, "In the salt pit that is under the steps: forty-one talents of silver. In the cave of the old washer's chamber, on the third terrace: sixty-five ingots of gold." As noted above, the listed treasure has been estimated in the tons. There are those who understand the text to be enumerating the vast treasure that was 'stashed,' where the Romans could not find it. Others still suggest that the listed treasure is that which Bar Kochba hid during the Second Revolt. Although it is difficult to estimate the exact amount, "it was estimated in 1960 that the total would top $1,000,000 U.S."
The treasure of the scroll has been assumed to be treasure of the Jewish Temple, presumably the Second Temple, among other options. Fourth, Gaster's own favourite theory is that the treasure is a hoax. There are other options besides those listed by Gaster (see Wolters in Bibliography p. 15-17 for a more up-to-date list). For instance Manfred Lehmann considered it Temple contributions collected after 70 CE. Scholars are divided as to what the actual contents are. However, metals, such as copper and bronze were a common outlet with which archival record were kept. Along with this, "formal characteristics" establish a "line of evidence" that suggest this scroll is an authentic "administrative document of Herod's Temple in Jerusalem." As a result, this evidence has led a number of people to believe that the treasure really does exist. One such person is John Allegro, who in 1962 led an expedition. By following some of the places listed in the scroll, the team excavated some potential burial places for the treasure. However, the treasure hunters turned up empty handed. Robert Eisenman, in his book James the Brother of Jesus argues that the Copper Scroll is an authentic treasure map created by the Essene community, and places its authorship around the time of the First Revolt. He later maintains that a duplicate copy of the scroll may have been discovered by the Knights Templar during the First Crusade, who then dug up all the treasure and used it to fund their order. These claims are not taken seriously by most scholars. It is more than plausible that the Romans discovered the treasure. Perhaps when the temple of Herod was destroyed the Romans went looking for any treasure and riches the temple may have had in its possession. The Romans might easily have acquired some or all of the treasure listed in the Copper Scroll by interrogating and torturing captives, which was normal practice. According to Josephus the Romans had an active policy regarding the retrieval of hidden treasure. Another theory is that, after the Roman army left after the siege, Jewish people used the copper scroll to retrieve the valuables listed, and spent the valuables on rebuilding Jerusalem. In 1958, novelist Nathaniel Norsen Weinreb published The Copper Scrolls, the tale of a scribe named Kandane who is hired by a priest from Qumran to inscribe a list of sacred treasures. Weinreb wrote his novel before he or the general public learned that the so-called 'scrolls' of copper, were in reality, two separated sections of what was originally a single scroll about eight feet in length. A Long Way to Shiloh (known in the USA as The Menorah Men so as not to be thought a Civil War novel) is a thriller by Lionel Davidson, published in 1966, whose plot follows the finding and contents of a similar treasure scroll. The denouement of Edwin Black's Format C: included using the Copper Scroll to find the Silver Scroll, giving the protagonists the information they needed to find and defeat the main threat of the book. The Copper Scroll is the subject of a political thriller, The Copper Scroll, by Joel C. Rosenberg, published in 2006. This book implements its author's theory that the treasures listed in the Copper Scroll (and the Ark of the Covenant) will be found in the End Times to refurnish the Third Temple. Prior to Rosenberg's book, Ellen Gunderson Traylor's book, The Priest (Thomas Nelson 1998), gave a fictional account of the Second Copper Scroll (alluded to in the first scroll), as giving the identity of the high priest of Israel, traced from the lineage of Aaron. Based on interviews with archeologists and rabbis of the Temple Institute in Jerusalem, the book references research being done to locate the individual who will head the planned temple when it is rebuilt. It also features in Sean Young's novel, Violent Sands. In this historical novel, Barabbas is the sworn protector of the Copper Scroll and the treasure it points to. He is under orders to protect this document at all costs. Another novel in which the Copper Scroll figures prominently is Will Adams's The Exodus Quest. The scroll—and a search for its treasures—was featured in a 2007 episode of The History Channel series Digging For The Truth. The program gives a basic knowledge of the research of the Copper Scroll and all the major theories of its interpretation. ^ "The Bible and Interpretation - On the Insignificance and the Abuse of the Copper Scroll". Bibleinterp.com. Retrieved 2015-11-26. ^ "Новости - Библейский альманах "Скрижали"". Luhot.ru. 2013-07-29. Retrieved 2015-11-26. ^ "Dead Sea Scrolls". Facsimile Editions. Retrieved 2015-11-26. ^ "Copied copper scroll is one to treasure". The Jewish Chronicle. 5 September 2014. Retrieved 15 June 2017. ^ Lundberg, Marilyn J. "The Copper Scroll (3Q15)". West Semitic Research Project. Retrieved 5 April 2011. ^ a b c d Wise, Michael (2005). A New Translation: The Dead Sea Scrolls. New York: Harper Collins Publisher. pp. 211–223. ISBN 978-0-06-076662-7. ^ Allegro 1960, pp. 22–24, 27. ^ Al Wolters, article on the "Copper Scroll", in Schiffman, 2000a (Vol.2), p.146. ^ George J. Brooke; Philip R. Davies (27 October 2004). Copper Scroll Studies. A&C Black. p. 46. ISBN 978-0-567-08456-9. Retrieved 2015-11-26. ^ See Poffet, et al. 2006. ^ Puech, "Some Results of the Restoration of the Copper Scroll by EDF Mecenat", in Schiffman, 2000b, p.893. ^ a b c VanderKam, James C. (2010). The Dead Sea Scrolls Today. Michigan: Wm. B. Eerdmans Publishing Co. pp. 92–93. ISBN 978-0-8028-6435-2. ^ Lundberg, Marilyn J. "The Copper Scroll (3Q15)". West Semitic Research Project. Retrieved 4 April 2011. ^ Milik, J.T (September 1956). "The Copper Document from Cave III, Qumran". The Biblical Archaeologist. 19 (3): 60–64. JSTOR 3209219. ^ "NOVA | Ancient Refuge in the Holy Land". Pbs.org. Retrieved 2015-11-26. ^ Lundber, Marilyn. "The Copper Scroll (3Q15)". West Semitic Research Project. Retrieved 4 April 2011. ^ Theodor H. Gaster (1976). The Dead Sea Scriptures. Peter Smith Publishing Inc. ISBN 0-8446-6702-1. ^ See Greenfield's review of Milik "The Small Caves of Qumran" in Journal of the American Oriental Society Vol. 89, No. 1 (Jan.–Mar., 1969), pp. 128–141). Allegro, John M. (1960). The Treasure of the Copper Scroll. Garden City, NY: Doubleday. Brooke, George J.; Philip R. Davies, eds. (2002). Copper Scroll Studies. Journal for the Study of the Pseudepigrapha Supplement Series, Vol. 40. New York: Sheffield Academic Press. ISBN 0-8264-6055-0. Gaster, Theodor (1976). The Dead Sea Scriptures (3rd ed.). New York: Anchor Books, Doubleday. ISBN 978-0385088596. Lefkovits, Judah K. (2000). The Copper Scroll 3Q15: A Reevaluation: A New Reading, Translation, and Commentary. Studies on the Texts of the Desert of Judah, Vol. 25. Leiden, The Netherlands: Brill Academic Publishers. ISBN 90-04-10685-5. García Martínez, Florentino; Tigchelaar, Eibert J. C., eds. (1999). The Dead Sea Scrolls: Study Edition, Vol.1 (2nd ed.). Leiden, The Netherlands: Brill. ISBN 9789004115477. Feather, Robert (2003). The Mystery of the Copper Scroll of Qumran: The Essene Record of the Treasure of Akhenaten. Simon and Schuster. ISBN 9781591438571. Parry, Donald W. (2005). Tov, Emanuel, ed. The Dead Sea Scrolls Reader, Vol. 6: Additional Genres and Unclassified Texts. Leiden, The Netherlands: Brill Academic Publishers. pp. 250–261. ISBN 90-04-12646-5. Puech, Emile; Poffet, Jean-Michel; et al. (2006). Le rouleau de cuivre de la grotte 3 de Qumrân (3Q15): expertise, restoration, epigraphie (2 vol.). Studies on the Texts of the Desert of Judah, Vol. 55. Leiden, The Netherlands: Brill, École biblique et archéologique française de Jérusalem, EDF Foundation. ISBN 978-90-04-14030-1. Puech had access to the cleaned artifact and scans; Vol. 1, pages 169–216 has his text, commentary and French and English translations. Shanks, Hershel, ed. (1992). Understanding the Dead Sea Scrolls. New York: Random House. ISBN 0-679-41448-7. Schiffman, Lawrence H.; VanderKam, James C., eds. (2000a). Encyclopedia of the Dead Sea Scrolls, Vol.1. Oxford: Oxford University Press. ISBN 0-19-513796-5. Schiffman, Lawrence H.; Tov, Emanuel; VanderKam, James C., eds. (2000b). The Dead Sea Scrolls Fifty Years After Their Discovery. Jerusalem: Israel Exploration Society. ISBN 978-965-221-038-8. Wolters, Albert (1996). The Copper Scroll: Overview, Text and Translation. Sheffield: Sheffield Academic Press. ISBN 9781850757931.